Kalamkari and Ajrakh, Ikat and Mangalgiri — Riti’s near Commercial Street has everything that will please handloom lovers. You can choose from fabrics, ready-made apparel, and sarees too. Over 7 years old, Riti’s, just off Commercial Street, is a favourite with shoppers. Spread across three levels, the store stocks hand block printed cottons and handlooms sourced from Kutch in Gujarat to Pedana in Andhra Pradesh. We were told that they even have their team of in-house printers who produce exclusive designs for the brand. Many of their offerings also feature vegetable dyes. If you prefer to customise your clothing, we recommend you head straight to their fabrics section. You can browse through stacks of ikats in a range of hues — from powder blues to off-whites. We also spotted Kalamkaris in deep earthy hues and bold motifs, and fabrics with Kantha work on them. 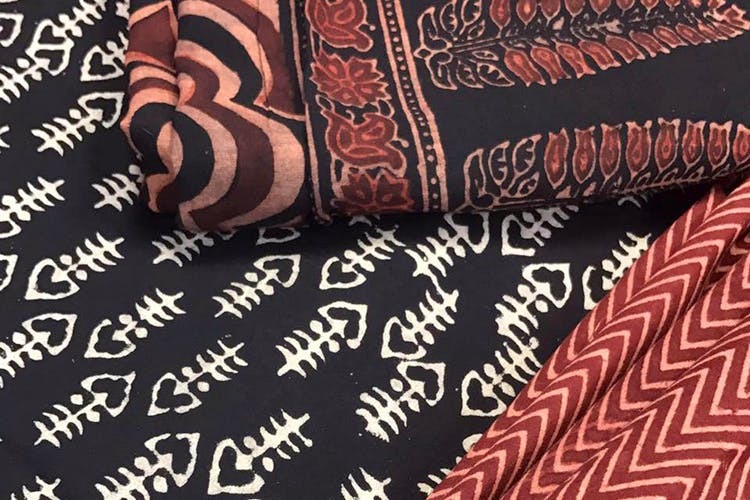 Ajrakh and Bagru prints are also part of the collection. Fabric prices begin at about INR 125 and go up to INR 900 a metre. At the basement level, Riti’s showcases a readymade creations. To highlight how versatile fabrics are, the collection is not just limited to kurtas, skirts, and palazzos. But you can also pick up bags, and, even slippers crafted from cloth. Sarees and salwar suits are available too. These are priced between INR 750 and 3,000. Riti’s even provides tailoring services to its clientele.